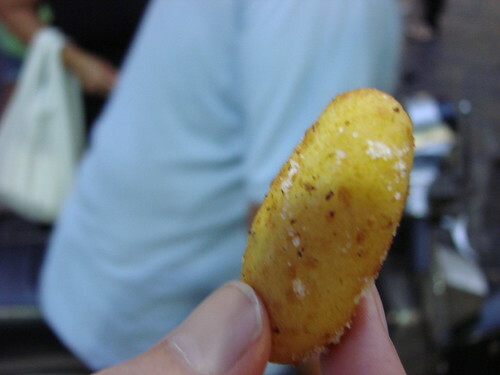 Fried baby potatoes from Friggitoria Fiorenzano on Piazza Montesanto. Perfectly fried. Perfectly salted. These bitty potatoes come 5 to an order for under 1€. 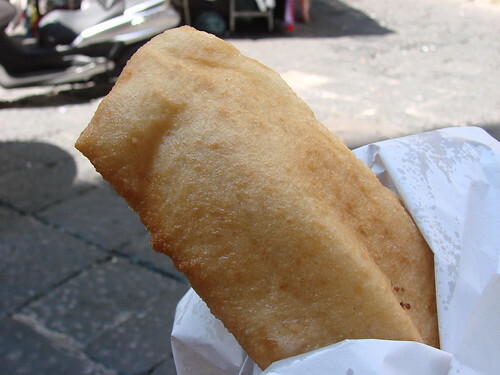 Fried bread stuffed with proscuitto and cheese from Friggitoria Fiorenzano. This proscuitto is more of the regular ham variety, so don’t get your Parma hopes up here. Still this was wonderfully fried and filling and only 1.20€. Up the street from Fiorenzano there’s a bakery with a glass enclosed counter that faces the street. 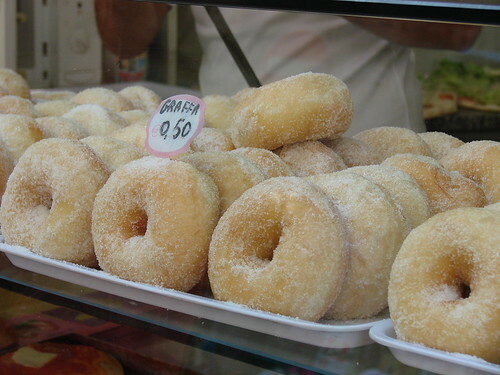 In the morning it’s full of fresh big, soft, sugar coated doughnuts that are only .50€. My idea had been to save this doughnut for a few minutes while I obtained coffee, but when all that stands between you and a fresh doughnut is a little napkin, well...one bit turns into two, and two bites turn into three. Delicious. I could go for one right about now. San Benedetto Pesca The while waiting in line for his lunch, apparently DiPaolo‘s is one of the few places in the city that carries it. The tea had a really strong peach flavor and is made with acqua minerale natuarale aka still mineral water. 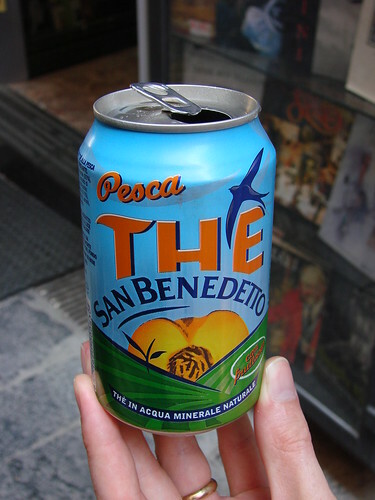 In Naples it goes for about .49€ a can at the supermarket and about 1.50€ at the various minimarkets around town. If you’re going to be drinking a lot of bottled water while visiting the city you’ll do well to stop by a supermarket and pick up your bottles there for significantly cheaper than at little stores or cafes. With only a few days in the city Lawman and I confined our pizza eating to some a few sit down places in the city, but street pizza is readily available as a snack by the slice, as a pizza roll, fried dough pizza, and in the form of a small pie. Lawman and I had a meal at Di Matteo and noticed as we left that they had little pizzas for 1€ and 1€ take out arancini, meat and pea stuffed fried rice balls. 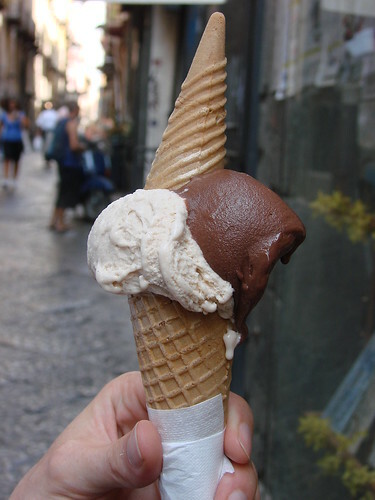 Gelato is plentiful in Naples and rather than hit up a gelataria, we decided to try a cone at Gay Odin, the city’s famed chocolatier. Like Jacques Torres they are known for their cioccolato e pepperoncino or chocolate with chiles. We paired this with a creamy latte e cannella a sweet cinnamon flavored gelato. The chocolate almost tasted like it had a rum base. Upon first lick you didn’t really taste the chili, but if you wait a few seconds you get a bit of a fiery kick. Cappuccino, Café Nonno, Café Freddo, Granita...there’s a wealth of ways to drink coffee in Naples. You can grab a seat at on outdoor café and make it a leisurely affair or have your drink right at the espresso bar. 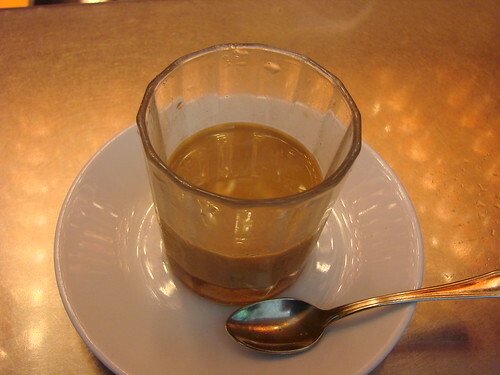 Neapolitans like their coffee sweet so any pre-made beverages like the creamy Café Nonno, the chilled Café Freddo, or the icy granita are going to be sweetened. Coffee drinks ranged from about 1€ to 2.501€ at the places we stopped in. Cafe Mexico had a particularly refreshing Café Freddo. 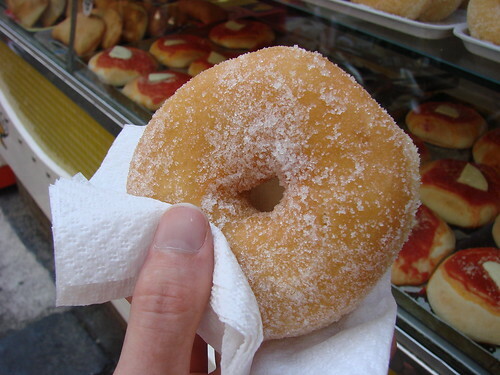 What are your favorite street foods in Naples or elsewhere in Italy? Naples looks heavenly! I would be in so much trouble if I lived there, I would devour everything in sight! Naples was my favorite part of Italy when I went there to visit friends, luckily it's where we were staying! I remember the day we got there my friend (we were only about 13 at the time) said we were going to get pastries so we took off, almost getting hit by the CRAZY traffic several times, to a little pastry shop a few blocks away. I had never tasted such yummy treats! We got a box of pastries to bring back for our families and made a detour into a park selling fresh, warm cotton candy (which we also enjoyed) and then got back to the apartment just in time for fresh, real Margerhita pizza. It's very telling than my favorite memories of the place are of the food. It was all SO GOOD. 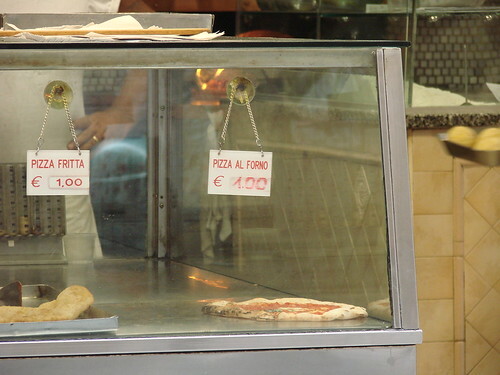 Would love to go back someday, if even for a few days, just for some pizza and pastries. New York Baby Show 2019 – TICKET GIVEAWAY! Red Hook for the Win!